The invisible eye of the marketplaceI have been following satellite Internet service since the 1990s, but I was surprised when I learned last week that Amazon had filed an application for a 3,236-satellite constellation of low-earth orbit Internet service satellites — Project Kuiper. I shouldn't have been surprised — Amazon was an infrastructure company from the start. In his first post-IPO letter to shareholders in 1997, Jeff Bezos pointed out that their distribution center capacity grew from 50,000 to 285,000 square feet and said their goal remained "to continue to solidify and extend our brand and customer base. This requires sustained investment in systems and infrastructure to support outstanding customer convenience, selection, and service while we grow." Today Amazon infrastructure is used internally and is offered as a service to others. Their distribution centers are now highly automated and they distribute a lot more than books. Amazon also offers Web, cloud storage, shipping and delivery services, credit cards, a voice application platform, an affiliate retailer program, satellite ground stations, automated retail stores, pickup locations, Whole Foods stores and other things I am probably overlooking. Bezos personally owns the Washington Post and the Blue Origin aerospace manufacturing and spaceflight services company. (Blue Origin has a contract to launch satellites for Telesat, a Project Kuiper competitor). Bezos' preparation for Project Kuiper was hiding in plain sight with the reference to road building in the Blue Origen mission statement: "We're committed to building a road to space so our children can build the future" and it should have become more clear when Amason added fully-managed satellite ground station service to its Web Service offering. Amazon says Project Kuiper "will provide low-latency, high-speed broadband connectivity to unserved and underserved communities around the world." That may be true, but it is the tip of the iceberg — like Amazon saying in 1994 that they would deliver low-cost books to homes. During the industrial era, infrastructure companies like railroads and oil and steel companies grew as quickly as possible to achieve economies of scale and create barriers to entry and profit from usage fees and sales. In the information era, data is as essential as fees and sales. Esther Dyson pointred that out in 1995, the year after Jeff Bezos founded Amazon, and it was reaffirmed recently when Softbank founder and CEO Masayoshi Son justified his billion dollar investment in OneWeb's satellite constellation, saying "whoever gets the most data wins." Stacy Mitchel has researched the ways Amazon has applied Dyson's insight. Since many people go straight to Amazon rather than use a search engine when shopping for products, Amazon learns what people want, what they eventually buy and don't buy and how much they pay. They use that market knowledge to decide what to feature in search results, which products to brand or manufacture themselves, which companies to buy, etc. Their size and information facilitate optimal and, in some cases predatory, pricing. Mitchel cites book sales and their zapping of Zappos as examples of the latter and also shows ways in which Amazon has used government subsidy. (Imagine the price war between Jeff Bezos and Elon Musk). Amazon harvests data from all of their infrastructure offerings. For example, Netflix uses AWS. They even learned a lot about local demographics, real estate prices, labor costs, etc. when they invited cities to apply to be the site of Amazon's future headquarters. But, what's wrong with this? Amazon is efficient and has kept prices low, and their customer service is terrific. That sort of reasoning has dominated US anti-trust enforcement in recent years, but it is partial and short-sighted. Prices that are low enough to maintain rapid growth suit Amazon well now, but in the long run, competition and transparency fuel low prices, efficiency and the broad distribution of wealth and income. Industrial era concentration of power resulted in anti-trust action in the early 20th Century, but those were simpler times. In the letter to shareholders mentioned above, Bezos also stated that "there are significant opportunities to better serve our customers overseas." How can we achieve competition between global Internet service providers like Amazon, SpaceX, OneWeb and Telesat that are outside the jurisdiction of a single nation? There is no simple answer to that question. We can't put the genie back in the lamp, but we have seen some success with government operation of neutral, free or wholesale infrastructures like roads, sidewalks and municipal backbone networks and Google has had some success with fair, wholesale networking in Africa. Europe is beginning to look for ways to encourage competition, transparency, and privacy. 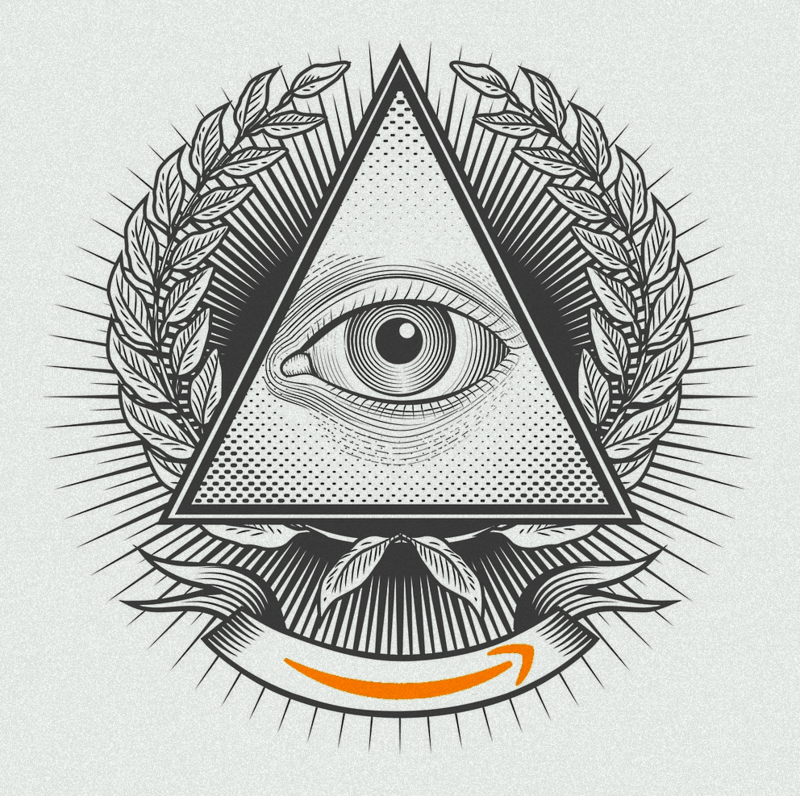 In yesterday's 2018 letter to shareholders, Jeff Bezos reported that 58% of Amazon.com retail sales are made by independent third-party sellers, emphasizing that they "helped independent sellers compete against our first-party business by investing in and offering them the very best selling tools we could imagine and build," i.e., infrastructure. He singles out Fulfillment by Amazon, the Prime membership program, Amazon Web Services, database tools, SageMaker for machine learning and Alexa, which is built into 150 different products. He also points out that Amazon remains a small player — "low single-digit percentage" — in global retail largely because nearly 90% of retail remains offline, in brick and mortar stores. But they are working on infrastructure for them — Amazon Go stores. He has convinced me — forget retail; Amazon is an infrastructure company. Amazon's infrastructure yields revenue and data, and that data can be used in restraint of trade, but Amazon is not all bad. As Bezos points out, they create jobs and valuable services as do others who use their infrastructure. Elizabeth Warren and others are calling for changes to US tax and anti-trust laws, but we need to be careful not to throw out the baby with the bathwater. (Full disclosure — I loved Mrs. Maisel, the Big Sick, and many more and bought a terrific pasta cooker at Amazon.com yesterday). The issue is further complicated by the fact that this is not a US issue; it is global. Amazon, SpaceX, Samsung and others are Global infrastructure companies in competition with China, a global infrastructure country. Local Time: Tuesday, April 23, 2019 07:03 AM PDT – Page Load: 0.2922 Sec.